This is not the first time I’ve made chocolate bread, don’t be silly! Back in 2010 I made this chocolate, chilli & lime bread. It was scrumptious and I’m feeling rather surprised I’ve not made it again. Other recipes include a no knead spelt cocoa bread, spelt cocoa pitta breads and any number of yeasted buns including these cornish saffron buns. However, none of them have been quite as adventurous as this spiced triple chocolate bread loaf. My concept was to have three different doughs plaited together to form a whole: dark chocolate & chilli, milk chocolate & cardamom and white chocolate and vanilla. I wanted the spiced triple chocolate bread to have detectable flavours, but they needed to be well balanced and not overwhelming. Success! The loaf is delicious just spread with butter and it makes perfect toast. And who needs air fresheners when you can scent the whole house with the fragrance of a spicy bake? I always use organic flours when baking and like to include at least half wholemeal flour for the additional minerals and roughage it brings. Fast action or instant yeast is a no no as it contains all sorts of additives that I’d rather not have in my bread. I use fresh yeast when I can get it or plain dried yeast instead. This does mean having to mix the yeast with the liquids first to dissolve it, but that really doesn’t add a great deal of time to proceedings. As it’s #OrganicSeptember, I also used organic chocolate in this triple chocolate bread; most of my spices are organic anyway. An enriched bread dough flavoured with three different chocolates and three spices, then plaited and shaped to form a twisty round loaf. Warm the milk to tepid , then add the yeast and stir until dissolved. Mix all ingredients, except the spices and chocolate together and knead either by hand or with a machine for 10 minutes. Divide the dough into three. Knead the white chocolate into one piece until thoroughly combined, knead the milk chocolate and ground cardamom into another piece and the dark chocolate and chilli into the third piece. Roll each piece into long strips, plait them and coil or form into a circle. I placed mine in a bundt mould, but the dough can be left free standing on a lined baking sheet. Cover and leave to rise until doubled in size. Bake at 200℃ for about 45 minutes or until the bottom of the loaf sounds hollow when tapped and the top is nicely browned without being burnt. Turn out onto a wire rack to cool. If using the glaze, heat the milk and stir in the sugar until dissolved. Brush over the hot loaf. Preparation time does not include proving times. Place a small tray of water in the oven along with the bread to create some steam, which will help the bread rise. Once again, I’m joining in with this week’s Great Bloggers Bake Off 2016, #GBBOBloggers2016 hosted by Mummy Mishaps. This triple chocolate bread is one of several recipes I hope to post as part of #OrganicSeptember, which is all about making small changes this year. Thanks for visiting Tin and Thyme. If you make this spiced triple chocolate bread, I’d love to hear about it in the comments below or via social media. Do share photos on social media too and use the hashtag #tinandthyme, so I can spot them. For more delicious and nutritious recipes, follow me on Twitter, Facebook, Instagram or Pinterest. Triple Chocolate Bread. PIN IT. I saw this on facebook and was drooling over it. You managed it better than most of the contestants on GBBO. Nice loaf! Ah thanks Jac, I’m not sure the judges would be so generous. I was quite pleased with the end result, but I did have a lot more time than the GBBO contestants. Chocolate bread is not an easy beast but you have done an amazing job! Would have loved to taste this – though the chocolate chilli lime one sounds amazing too. Thanks Lucy. The hardest part was kneading the chocolates into the dough. I would have liked a more polished look, but I’m very happy with the flavours and texture. Must make that chilli lime bread again! 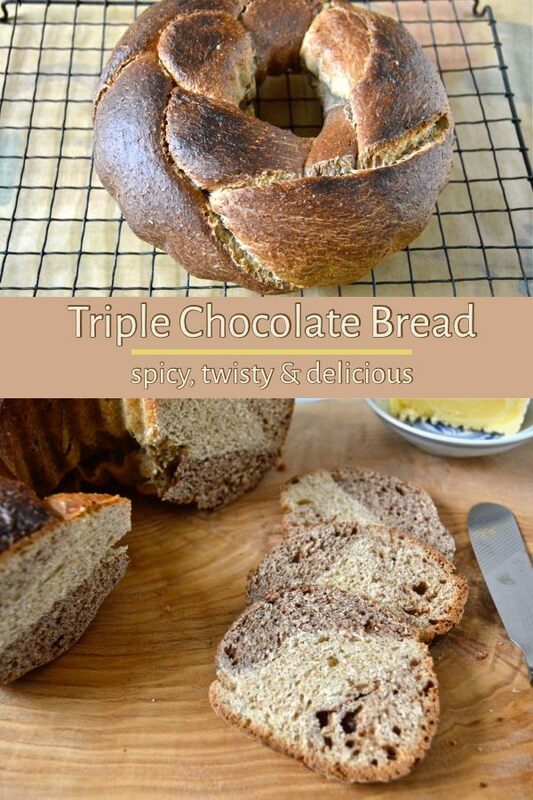 This looks so good… I just wish I like chocolate in bread! Hahaha Gina. You’re missing a trick. The bread has a nice combination of flavours and isn’t too chocolatey nor too sweet. Your bread sounds absolutely delectable and definitely worthy of star baker – a perfect signature bake for a chocolate lover. Ah thanks Janice. I’m really enjoying getting a different flavour combination in every mouthful. It’s a bit of a faff to make, but definitely worth it for special occasions. Thanks very much Cathy. I just couldn’t help but take part in this one. Thanks Jenny. I’ve just had a couple of slices toasted for a late breakfast and I really like getting a different flavour combination in every mouthful. This looks gorgeous, I think you’d have won the challenge if you’d made this on the show! Hahaha, thank you Mandy. I don’t think my bread would be polished enough for the GBBO judges, but it sure tastes good. I love the look and sound of this bread. It looks delicious. I really enjoy a chocolate bread and yet I don’t think I’ve eaten one for years. I’m missing out. This looks lovely – 3 chocolates are going to be better than 1. Such a professionally baked braided bread! Good job, Choclette. Thank you Angie, that’s praise indeed. Three types of chocolate, now thats showing off! but i love it what a great idea. Until I read your recipe I didn’t realise each strand had a different flavour, what a marvellous idea! using grated choolate is a great way to get the flavour in and I must try it! Thanks Lucy. I do like to get my flavours into things and spice and chocolate can make for great combinations. I’m so impressed by your loaf! It looks so impressive, and I LOVE the flavour combinations you chose! Thanks Becca. It was a grand loaf but sadly long gone now. Thanks Johanna. You’re so creative and always experimenting with everything. Go for it. 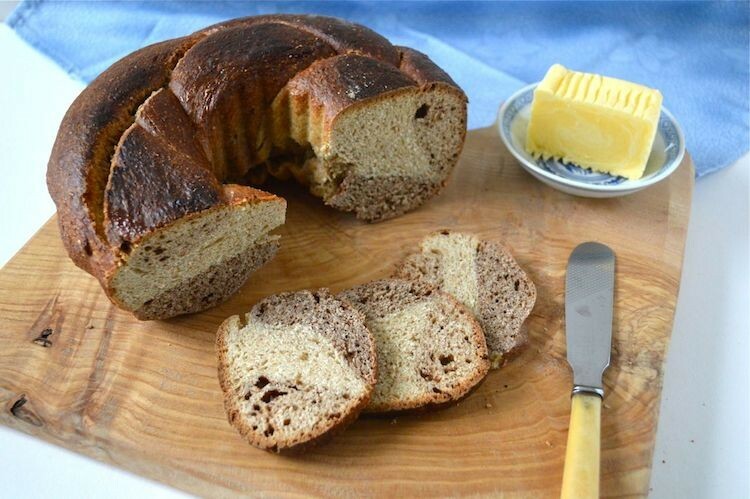 A fantastic loaf, looks brilliant and i love that you always incorporate wholemeal flours too – fantastic! Thanks Ceri. I grew up on a whole food diet, so started my baking life with wholemeal flour. Haha, you just can’t tell with our weird and changeable weather. We had flash flooding here in Cornwall yesterday, some of it was really bad. Thanks, it’s a tasty bread and makes fab toast too. I just love cardamom in any baking and I love the creative way you have made this bake – I would certainly love a slice or two right now!